New observations conclusively prove that ALL of the anomalous warming that has occurred from 1975-to the present has been due to the removal of dimming Sulfur Dioxide (SO2) aerosols from the troposphere due to EPA-driven Clean Air efforts. With all of the warming accounted for by the reduction in SO2 emissions, there can never have been any additional warming due to Carbon Dioxide (CO2) or other “greenhouse” gasses. Since 1850, there have been two economic depressions and 31 business recessions (1). ALL are associated with temporary increases in average global temperatures, typically about 0.2 deg. C. (for recessions). These temporary temperature increases can only have been due to the reduction in the amount of dimming SO2 aerosols entering the troposphere because of the reduced industrial activity during an economic slowdown. (Any concurrent reduction in CO2 emissions would cause cooling, not warming, according to the greenhouse gas hypothesis). Cleaner air resulting from fewer SO2 aerosols entering the troposphere allows sunshine to strike the earth’s surface with greater intensity, causing increased surface warming. Figures 1-3 are Woodfortrees.com graphs of GISS and Hadcrut4 land-ocean surface temperature anomalies, and mean Extended Reconstructed Sea Surface Temperatures ( ERSST), with dates of economic slowdowns added to show the correlations (the few unlabeled peaks are due to El Ninos and/or reductions in SO2 aerosol emissions). Since the unintentional reduction of SO2 aerosol emissions in the troposphere causes temporary increases in average global temperatures, it follows that the intentional reduction of SO2 aerosols from the troposphere due to Clean Air efforts will also cause temperatures to rise. The question, then, is how much of the warming between 1975 and the present has been due to the reduction in SO2 aerosol emissions, and how much has been due to the accumulation of greenhouse gasses. As the aerosols settled out, temperatures recovered to pre-eruption levels, an increase of 0.50 deg. C. from the nadir, due to the cleaner, more transparent air. This represented a temperature rise of .02 deg. C. for each Megatonne of reduction in atmospheric SO2 aerosol levels—the “Climate Sensitivity Factor” (or Rule of Thumb) for temperature increases due to reductions in SO2 aerosol emissions. To test this conjecture, published data on the amount of anthropogenic SO2 aerosol emissions (in Megatonnes) in the atmosphere was obtained (5) and, where reported, was multiplied by the .02 sensitivity factor to determine whether the calculated temperature increases would match actual reported values (4). In every instance, the calculated values matched NASA’s reported Jan-Dec. average global land-ocean surface temperature anomalies to within .02 deg. C, or less, when natural variations due to El Ninos, recessions, La Ninas, and volcanic eruptions were accounted for. 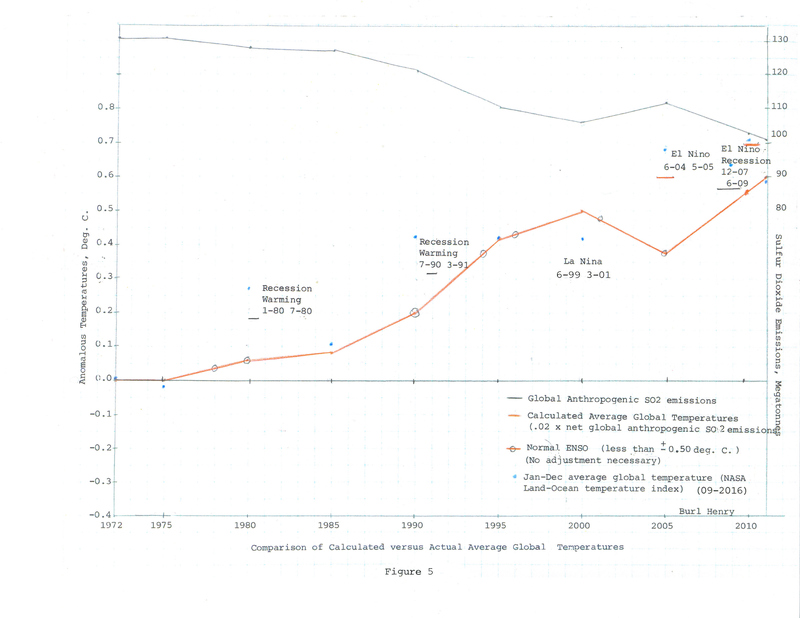 For example, Global SO2 emissions peaked in 1975 at a reported 131 Megatonnes (Fig. 4), and by 2011, due to Clean Air efforts, they had fallen to 101 Megatonnes, a reduction of 30 Megatonnes. Multiplying .02 times 30 would give an expected anomalous temperature rise of 0.60 deg. C., in 2011. 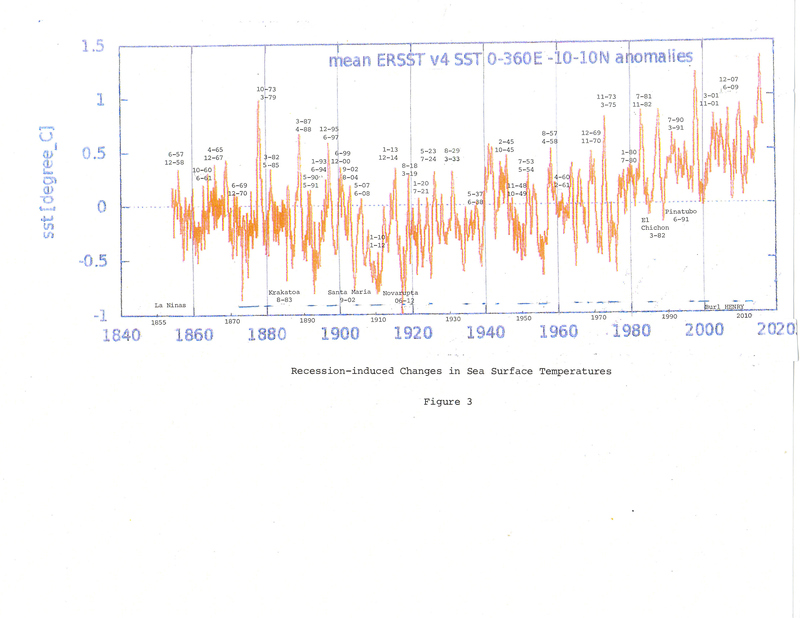 This is the exact value reported by NASA—completely correct after an interval of 36 years (Note that the 2011 data needed no correction for natural variations). 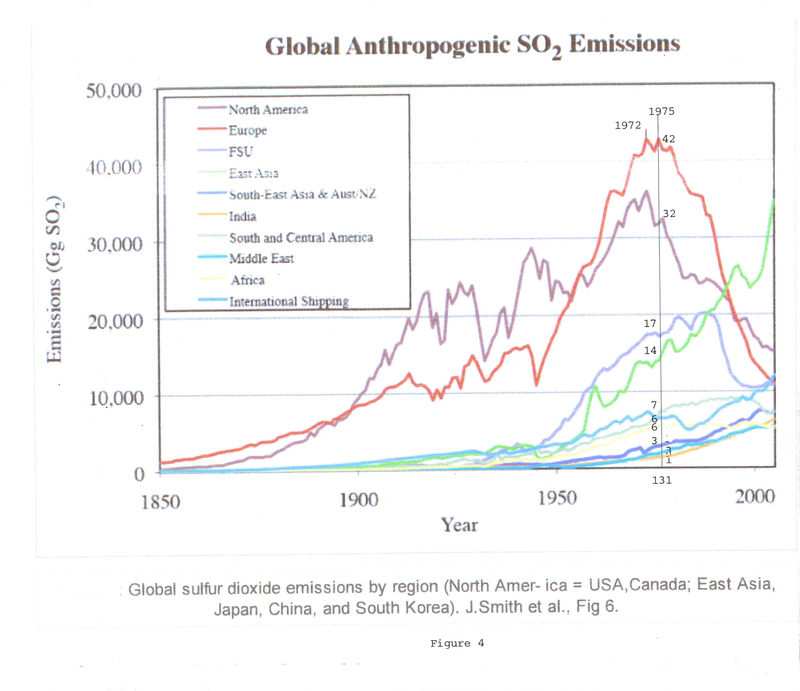 (See Table 1 for global SO2 emissions, 1972-2011, and Fig. 5 for “Calculated versus Actual “ temperature increases for a plot of the tabular data). Because of the essentially exact temperature agreement obtained solely by considering reductions in SO2 aerosol emissions, there is no possibility of any additional warming due to “greenhouse gasses”. (The ”.02 deg. C. Climate Sensitivity factor” was initially obtained from the 1991 volcanic eruptions. However, it can also be calculated from the warming resulting from the reduction in SO2 aerosol emissions due to Clean Air efforts. The 30 Megatonne reduction in SO2 emissions noted above resulted in a temperature rise of 0.60 deg. C. Dividing 0.60 by 30 gives the same sensitivity factor of 0.02 deg. C. temp. rise for each net Megatonne of reduction in global anthropogenic SO2 aerosol emissions, proving that the climatic effect of stratospheric and tropospheric SO2 aerosols is identical). As Karl Popper wrote: “Scientific theories must be falsifiable (that is, empirically testable), and that prediction was the gold standard for their validation”. Unlike the greenhouse gas hypothesis, this “model” –which states that reductions in SO2 aerosol emissions are the actual cause of the anomalous global warming– meets both criteria. It is falsified during every large volcanic eruption, and every recession, and its predictions/projections are accurate to within .02 deg. 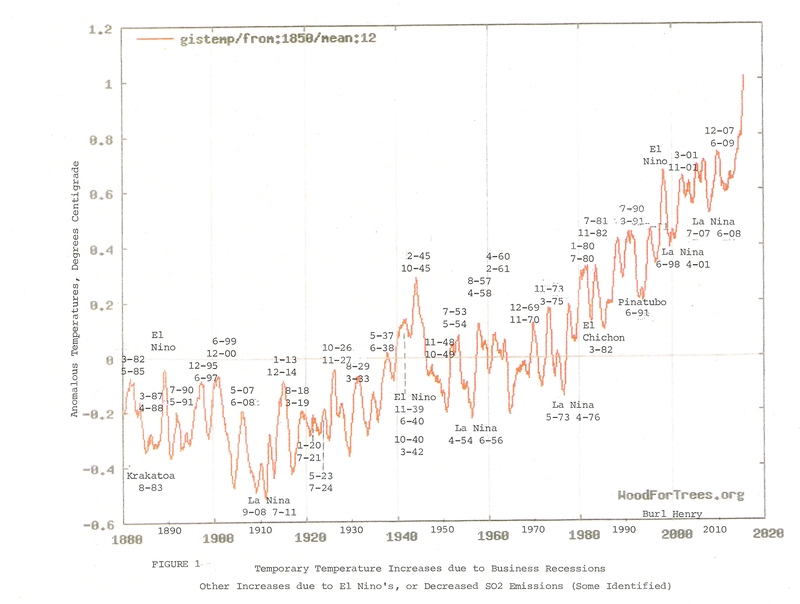 C.
Average global temperatures, unfortunately, can be expected to continue to rise at the rate of .02 deg. C. of warming for each net Megatonne of reduction in global SO2 aerosol emissions, if there are no off-setting happenings such as volcanic eruptions , La Ninas, or net increases in global SO2 aerosol emissions. Data on global anthropogenic SO2 aerosol emissions is currently available only through year 2011. Estimated decreases in emissions for 2012, 2013, and 2014 of 2 Megatonnes per year (as in 2011), would predict an anomalous temp. Increase, from 2011, of 0.12 deg C., to 0.72 deg. C. NASA/GISS reported 0.74 deg. C, slightly higher due to the El Nino which began in Oct. of 2014. Since 1972, average global temperatures have increased by 1.0 deg. C. If reductions In SO2 emissions continue at the current rate of approx. 2 Megatonnes per year, the “2.0 deg. C temp. rise since 1850” threshold established by the 2015 Paris Climate Conference will be met within 25 years, or, more probably, less, because of beginning efforts by China and India to reduce their massive pollution. This impending disaster, could, of course, be largely avoided by halting ALL further reductions in SO2 aerosol emissions (unlikely, as noted above). Since temperature increases due to reduced SO2 aerosol emissions cannot be reversed short of re-polluting the air, the development and implementation of mitigation strategies is urgently needed. It has been shown that, over a span of more than 150 years, the control knob for both temporary and permanent changes in average global temperatures has been the amount of dimming Sulfur Dioxide aerosol emissions present in the troposphere. This sensitivity to the presence of SO2 aerosols in the atmosphere undoubtedly also extends to earlier eras, where they would largely have a volcanic origin. 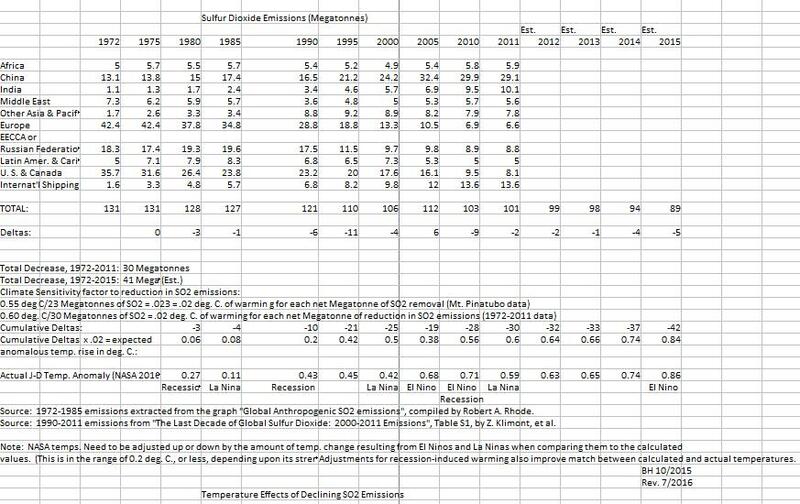 For the 1975-2011 period, projected/predicted warming based solely upon the amount of reduction in anthropogenic SO2 emissions is so exact that there can never have been any additional warming due to ”greenhouse gasses”. The continued reduction in anthropogenic SO2 aerosol emissions will cause average global temperatures to continue to rise, unless off-set by natural variations (La Ninas, volcanic eruptions, or increased SO2 emissions). Rather than being the cause of rising global temperatures, the burning of fossil fuels, with their attendant SO2 emissions, has helped to maintain average global temperatures to within acceptable limits. Too many emissions, however, will cause unwanted cooling. Interesting. 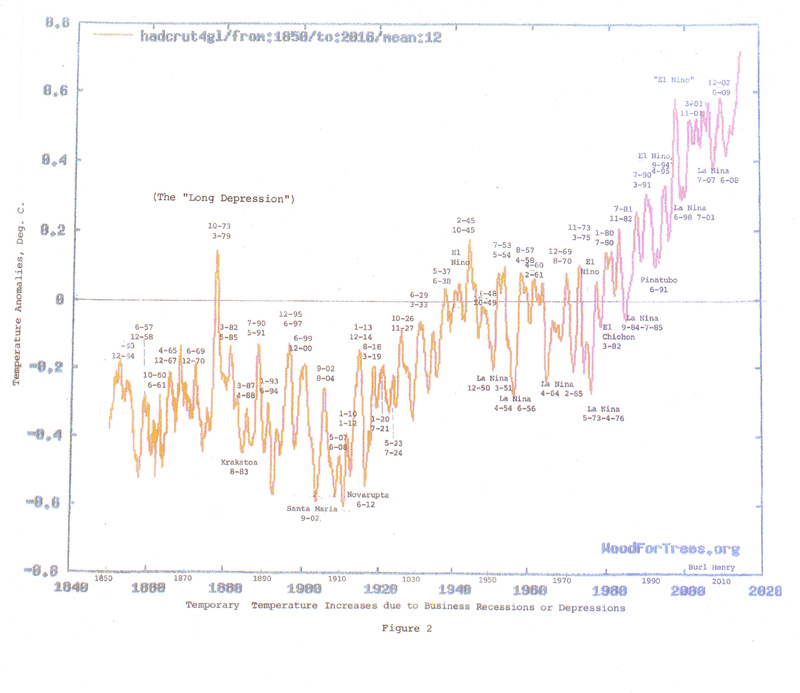 What correlates with “The Pause” in tempoerature increase 1999-2015? The Data – before adjustments. The near balance between Western reductions in SO2 emissions, and Eastern increases in SO2 emissions over the cited period resulted in a small NET change in global SO2 emissions and consequently little change in average global temperatures.